James Foley beheading: Did the United States make itself a target by bombing ISIS? 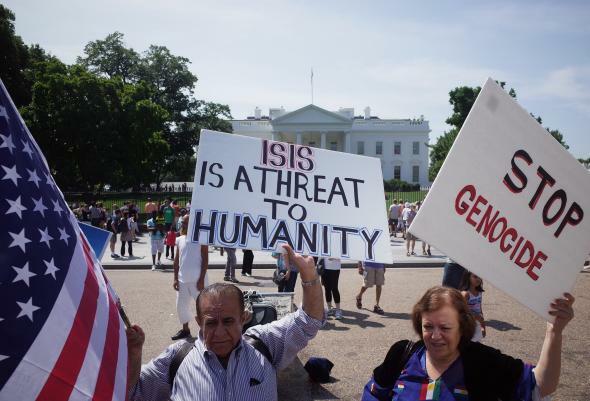 Pro-Kurdish demonstrators hold placards against ISIS in front of the White House on Aug. 16, 2014. The killing of James Foley has highlighted a tragic irony of the Obama administration’s decision to use military force against ISIS months after its rise to prominence in Syria. Advocates of such action have long warned that ISIS could pose a direct security threat to the United States if left unchecked. But these U.S. airstrikes may actually have made the group more likely to attack U.S. citizens and interests. ISIS and its predecessor organization, al-Qaida in Iraq, have long held hostile views toward the United States and its presence in the Middle East. It has issued threats against the U.S. before, including a promise to “raise the flag of Allah in the White House.” U.S. and European governments have also warned for some time that the large numbers of international fighters who have traveled to Syria to fight with ISIS could return with the means and know-how to carry out attacks in their home countries. So far there hasn’t been much evidence of this actually taking place. (One exception may be the case of Mehdi Nemmouche, the French national suspected of carrying out a shooting at a Jewish museum in Brussels in May, and who is believed to have fought with ISIS in Syria.) In general, ISIS has differed from its onetime patrons in al-Qaida by focusing more on capturing territory and building a viable Islamist state than attacking far-off enemies. In fact, U.S. officials have seemed far more concerned about the threat of Jabhat al-Nusra, al-Qaida’s “official” Syrian affiliate. This has arguably been to ISIS’s strategic benefit. It’s hard to believe the U.S. would have taken quite this long to send in the drones had there been evidence that ISIS was actively plotting attacks against the U.S. homeland or even U.S. facilities in the Middle East. Now, that’s obviously changed. With the U.S. bombing its forces in Iraq, there’s no benefit for ISIS in refraining from attacks against Americans. And if Iraqi and Kurdish forces, with U.S. help, succeed in rolling back the group’s territorial gains, it may start to act more like a traditional al-Qaida affiliate—operating underground, using tactics like suicide bombings rather than open military confrontations, and striking both local and international targets. A new front in the war has now opened up. The administration began airstrikes this month in part because ISIS was getting dangerously close to U.S. facilities and personnel in Kurdistan. In response, ISIS has now very publicly killed a U.S. citizen and is threatening to kill more. A number of experts are warning that the airstrikes are likely to prompt ISIS to plot more attacks against the U.S.—an unnerving prospect given the number of ISIS fighters likely carrying clean European or U.S. passports. Up until now, despite the escalating rhetoric, there’s been an uneasy peace between the U.S. and ISIS. Yes, the U.S. has provided some support to Syrian rebel groups fighting against the Islamic State, and ISIS has attacked the Iraqi government, a U.S. ally, but there had been little direct confrontation between the two. That’s obviously changed now, and while ISIS would certainly incur greater risk by engaging in a direct confrontation with the U.S. military, the Foley execution shows it does have some means to strike back. None of this is to say that the U.S. shouldn’t attack ISIS. It may be true that the U.S. could no longer tolerate the long-term security threat from ISIS’s rise. But at least in the short term, it certainly seems like that threat has now increased.